Let’s talk core strength here for a minute. Don’t worry we’re not going to ask you to do any sit-ups, crunches, planks or heaven forbid… burpees. We want to talk about the importance of core strength for your dog! So how exactly can your dog work their core? It’s easy! A workout is all about building muscle strength by holding a position with proper alignment for a period of time and moving around and through obstacles. There are many different exercises you can work on with your dog a lot of which we cover in our Pup-lates® class. We like to use obstacles, balance cushions, peanut and stability balls. Here are two basic exercises you can try at home, Puppy Pushups and Balancing Act. A Puppy Pushup is where you ask your dog to sit, then lie down and then back up to a stand. It’s that simple, when first learning the moves it’s OK to have treats to lure your dog into the three positions. After a while once the exercise has been learned you can give treats at random. A fun game that we like to play in our classes is to see how many pushups the dogs can do in 30 seconds. You’d be surprised at how athletic some of them are! The Balancing Act is where you ask your dog to place two of their paws on a couch cushion (taken off the couch and placed on the floor) and stand. It’s a pretty straight forward exercise working their core by holding themselves balanced. You should also alternate which legs are on the cushion(front then back) to make sure that they build strength through out their entire core. Instead of working out at home alone you and your dog could come to a Pup-lates® class right here at the Zoom Room. 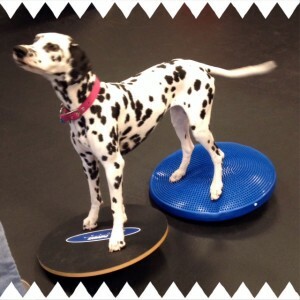 It’s a super fun class that improves body awareness, confidence, as well as working to build your dog’s core strength. And, is great for dogs of all ages and athletic ability! Remember to always check with your veterinarian before starting a new exercise regimen for your dog!